There are 8 reviews of Light Blue Eau Intense pour Homme. This one definitely lives up to its “eau intense” name; the projection is BEAST and the sillage leaves a long lasting trail. I personally love it, and it lasts a good 6+hours easy for me. 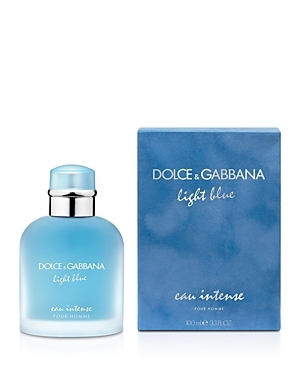 Pungent and charged up take on the D&G Light Blue pour Homme that is UNMISTAKABLY intense! It takes the now popular aquatic Light Blue, with its delightful salty sea and citrus-musk quality, and gives you a very masculine, deepened experience that eclipses the original. I enjoyed whiffing this several times over its quarter day or more longevity, and I know it left a trail! Opens very juicy and fruity and dries down salty and mellow. Lasts about 6 hours on my skin and projection is arms length for two hours, elbow length for the next two, and a skin scent for the last two hours. Overall a very nice fragrance for summertime and an improvement over the original. I posted this in the forum and thought it would be a good review for this. Dolce & Gabbana Light Blue Eau Intense mells like a good-times summer scent. Yes, I know, it is clearly a synthetic but, to my nose, it's got a tart-watermelon vibe that borders on a salty margarita scent with what smells like ozonic-moist-air permeating it. It's garnered two compliments in 3 wearings and it's going to be a "social scent" to wear in the summer heat at lunches, picnics, park, outdoor events, etc. This fragrance isn't pretending to be natural and the perfumer clearly was going for a happy vibe with this one. I like it and it just seems like what 'fun' smells like. The scent is linear, doesn't change. The performance is solid. I get 6-8 hours out of it. The scent trail and projection in my experience is completely determined by how many sprays I use. 2-3 sprays I think is appropriate for most people, but if you want a beast mode projection 6-9 sprays will accomplish that neatly. Very similar to the original. Has the salty, citrus aquatic notes covered. Almost goes into bug spray territory but the musk keeps it pleasant. Stays linear throughout. Very good projection and lasts 6-8 hours. Dolce & Gabbana Light Blue Eau Intense pour Homme Eau de Parfum 3.3 oz. There are no member images of Light Blue Eau Intense pour Homme yet. Why not be the first?